This section on facts about intelligent animals would not be complete without information on the amazing Bottlenose Dolphin. There are many interesting facts about the Bottlenose Dolphin; this page focuses on what studies have determined about this mammals notable intelligence. Scientists who have studied the behavior of this species have found many indications of their intelligence. For example, when dolphins are presented with a mirror, they are able to recognize themselves. Under conditions where they were to respond with yes or no answers, studies found that captive dolphins were correct most of the time. The reason why seems to indicate that dolphins have the ability to understand language. Below we'll look at some more kid-friendly facts and information about these smart mammals. Click here for a great selection of Amazon.com books about Bottlenose Dolphins. Although we look nothing alike, dolphins and humans do share an important body characteristic. Both of our brains are large in size, and they are also high functioning and complex systems. There is no accurate measure for determining a Bottlenose Dolphins IQ, but studies indicate that they are able to problem solve, use tools, are self-aware, and have advanced communication skills. Not only do dolphins likely communicate with sounds and clicks of different frequencies, but they also use a type of body language by using their tails and flippers above the surface of the water. It is believed that they communicate messages about food, threats and dominance. Bottlenose Dolphins are part of the cetacean species which includes whales and porpoises as well. Bottlenose Dolphins are very social creatures. They travel in groups, or pods, of varying sizes. It has been discovered that the group composition does change over time, but strong bonds are formed between some members of the group. Bottlenose Dolphins have been recorded jumping 16 feet (4.9 meters) out of the water. The main food source for Bottlenose Dolphins is fish. They hunt alone and in groups to catch their prey, mainly by using echolocation, a technique in which the dolphin relies on echoes in the water. Tuna fishermen kill numerous Bottlenose Dolphins every year when they get caught in Tuna nets. The lifespan of the Bottlenose Dolphin is estimated to be over 20 years in the wild, although some studies have found that these dolphins can live up to 40 years. A Bottlenose Dolphin can swim in short bursts up to 17 miles per hour or 27 kph. Sustained speeds are usually in the range of 5-7 miles per hour or 8-11 kph. With eyes on the sides of their head, Bottlenose Dolphins have very keen eyesight but a poor sense of smell, in contrast. Although size varies between males and females as well as with habitat, a typical male Bottlenose Dolphin weighs between 330 and 1,400 lb or 150 and 650 kilograms. Length is in the range of 6.6 ft to 13 ft (2-4 meters). The bottlenose Dolphin uses its blow hole for receiving essential oxygen from the air and as a means of ridding its body of carbon dioxide. 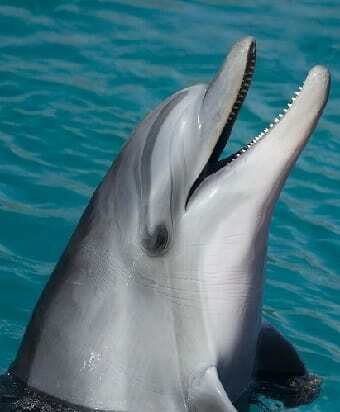 The dolphin also communicates with clicks, grunts, chirps, whistles, squeaks, and grunts through its blow hole. To aid in keeping the dolphins warm in colder waters, 18 to 20 percent of their bodyweight is blubber.